Depending on the age of your home there is a high likelihood that if you have a fireplace it’s a pre-fabricated metal fireplace box. If not the metal box then it has to be a masonry fireplace. Either way, please follow the guidelines of the manufacturer related either the metal fireplace box, exhaust flue piping, and/or gas log set. See below for a summary of the Technical Bulletins. First of all, safety is our primary concern and flooding on this scale where waters can be contaminated are a great concern of fireplaces that got partially or completely submerged in water. In flood situations, we must look after the structural elements of our products, the deteriorative effects of rust on internal unpainted surfaces, damage to soluble components, the possible harmful effects of contaminates and silt entering and filling internal passageways. Any fireplace and/or accessory that have been submerged must be replaced. However, if water has not touched the flue system, it may be used again during the replacement process, if water has covered any part of the flue system, then the entire system must be replaced. All metal fireplaces are installed with chimney components that are model and brand specific. Under certain circumstances you may be able to reuse your existing chimney. That’s true assuming that your existing chimney components are approved to be used with your replacement fireplace. There is no generic “one size fits all” chimney. In the event that your replacement fireplace cannot be used with your existing chimney, the chimney components will need to be replaced in addition to the fireplace. All metal fireplaces have a tag showing the manufacturers name and model number. The most common location for that tag is behind the screens, but I have seen them in other locations. 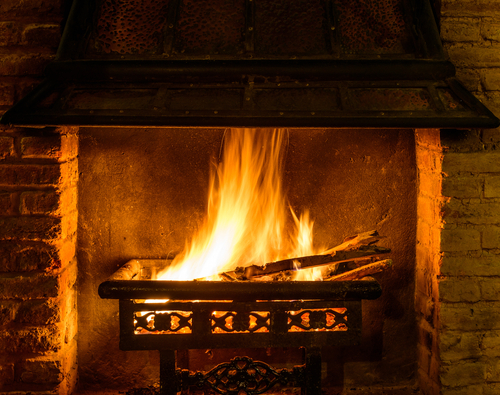 The first step in dealing with a flooded fireplace is to locate that tag to obtain the make and model of your fireplace so that you can contact your local dealer to find out what your available options. This technical information is to provide clarification policy involving flood-damaged Lennox, Superior, Marco Whitfield, Earthstove brand products, as well as Heatform log sets.